When I was a teenager I clipped out an advertisement from one of my comic books for the Art Instruction Schools, a correspondence course out of Minneapolis, MN. They responded with a “Talent Kit” booklet of various drawings that I made copies of. When I sent it back they would evaluate if, in their opinion, I had enough artistic talent to enroll. Another good friend of mine, Jimmy, who was the same age, signed up for the Famous Artists course, a similar program run by another school. The art spokesman for AIS was Charles Shultz, and for Famous Artists it was Norman Rockwell, and each school has very well known alumni. Sometime later a salesman showed up at our house and enrolled me in a two year course. I believe the price at that time was under $1000; an enormous sum for my father to come up with. During this recent Thanksgiving holiday I was visiting at my Mother’s home, and dug through a closet to find these old instruction books buried there. The first year was a basic art course to learn design and drawing skills. In the second year you could choose commercial art or painting. Thinking that a professional trade would be a more useful thing to pay for, my parents directed me towards the commercial art course, concentrating on cartooning. There wasn’t any back-and-forth communication with my instructor, David Kline. I would spend a month on each lesson that included questions on the text of the lesson and some assigned drawings, mail that in, and then he’d reply back with comments. Some of the letters he wrote me, however, were very astute towards my obvious problems with some good advice, if rather briefly stated. My grades were average and drawings showed some competence considering my age. I remain to this day very impressed with the quality of material presented in these books, as well as the teaching I received. I would reference that material for many years afterwards. 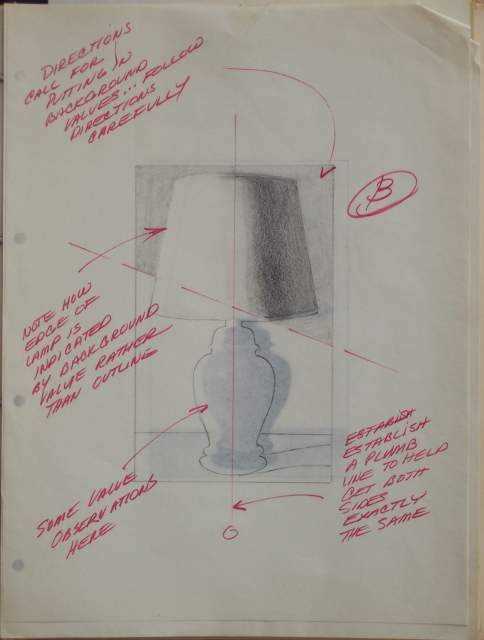 In this enclosed example you can see my attempt at a lesson for drawing objects. 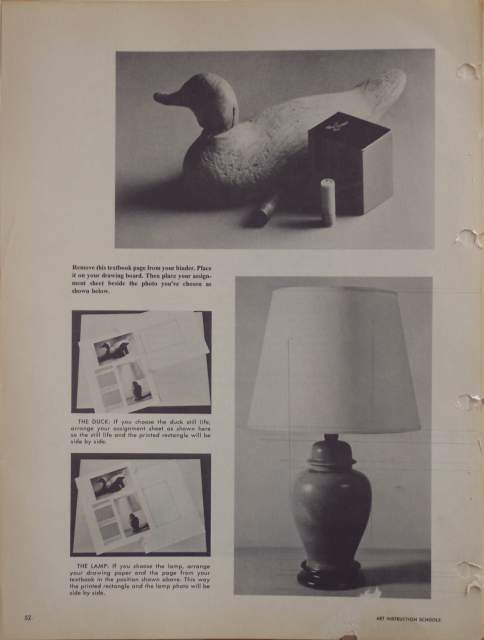 This part of the lesson required the choice of either a photograph of a duck or lamp following written text describing the sight-size method of drawing. 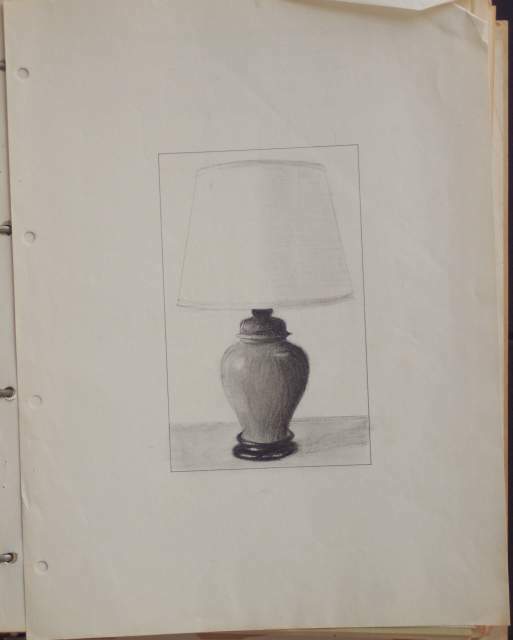 I chose the lamp, and did a barely passable drawing of it. You can see the tracing overlay showing his comments. Notice how he politely reprimanded me for not shading the background, and the instructions in the lesson were not that clear. It would have been something a teacher would have noticed in a regular class as the drawing was being made. That shows a shortcoming for mailing in completed work. You got no “do-overs.” His grade of “B” was very kind. Thanks, Dave. Jimmy graduated from his Famous Artists course also, but years later decided he no longer wanted his books, and very generously passed them over to me, which I still have in storage. Both courses are very similar, but I can’t say how well the teachers helped him with his lessons. 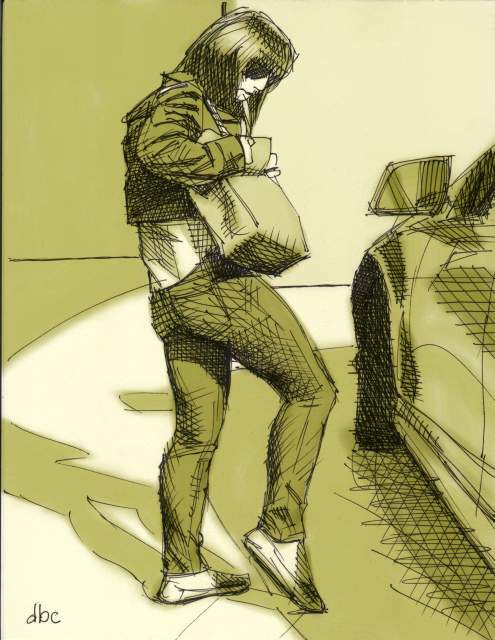 The course books for AIS seem more extensive and clearer to me in regards to basic art skills. The AIS course still exists today; although, I can’t speak about whether or not the instruction material or teaching may have changed over the years. It looks like the offered courses are different. For a kid like myself who had no real exposure to art instruction of any kind up to that point, it was a major challenge for me. It remains some of the best art education I ever received, and definitely helped prepare me for college. The Illustrator magazine was published quarterly by the school. It showcased instructors and student work in a couple articles within each issue by mostly black and white reproductions. They sponsored a competition for each issue in different categories, and one major prize every year. I entered once I think, but didn’t win anything. 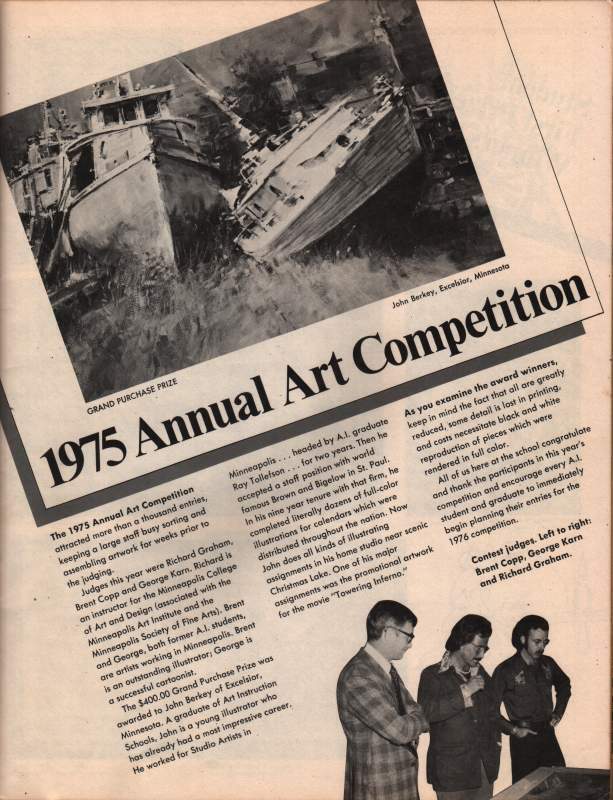 In the winter of 1976 the Grand Prize Award winner announced for the previous year was former student John Berkey, who went on to become a well-known illustrator. Here are a couple recent ink sketches. They are made using a Uni-ball pen I picked up recently called a Signo Gelstick, a ballpoint pen with acid free ink. 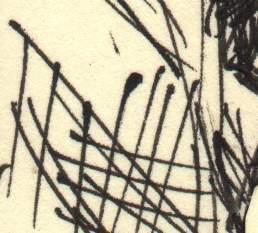 It seems to draw a nice black line, but has a tendency to “blot” when you first lay down a mark to paper. 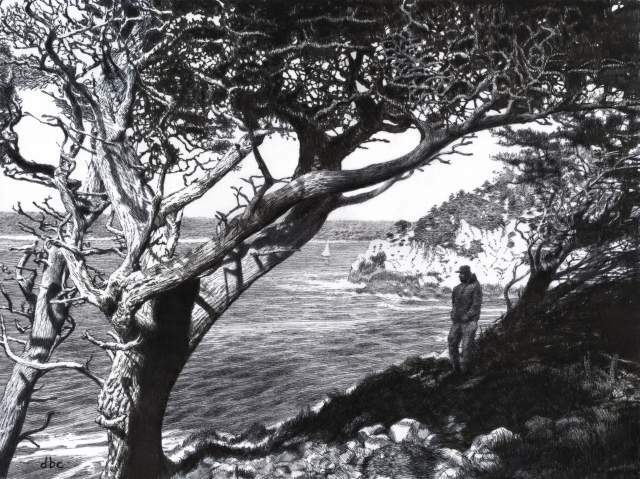 I decided to do a new version of a previous drawing which was posted here last November, “Point Lobos.” That drawing was okay, but felt I could still do a better job, especially with the water. 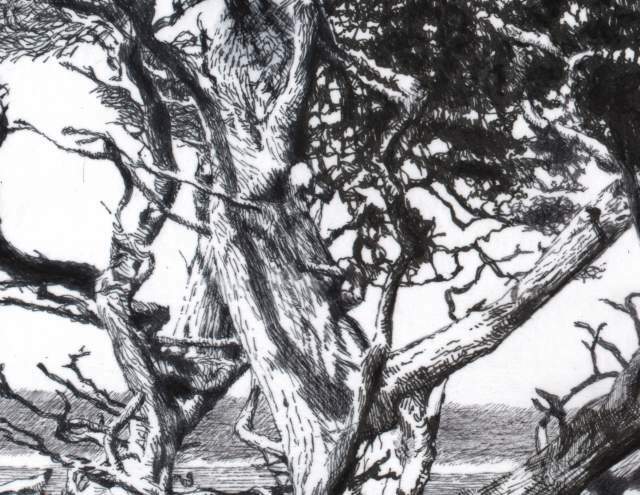 The background water, cliff, and horizon was drawn with Prismacolor liner markers (.005mm point,) and a Nikko-G pen nib was used for the trees and foreground area. The surface is Multimedia Artboard which can stand more abuse from a pen than regular paper. The size is about 16×12 inches. 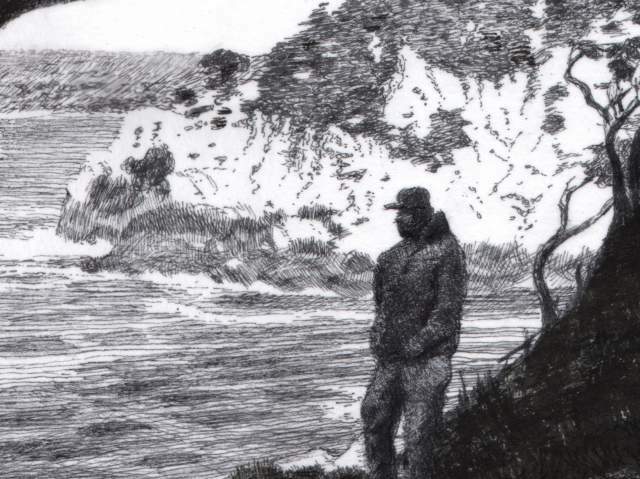 I’ve been spending some time browsing through the online library at the Eastman House site over the past couple days. They have an extensive collection of early photographs that are fun to sift through. I’d like to see them at least twice as large as they are, since some details are difficult to make out, but good to see nontheless. The GEH.og link there also displays photos of early cameras, including a few of my beloved Brownie. Wanted to post a couple recent sketches. Both in pencil, @ 8×10 inches. 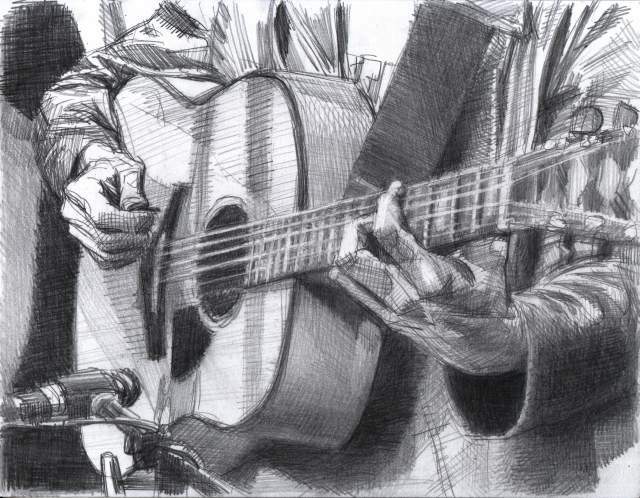 I enjoy drawing guitar players. They always have very expressive fingers. 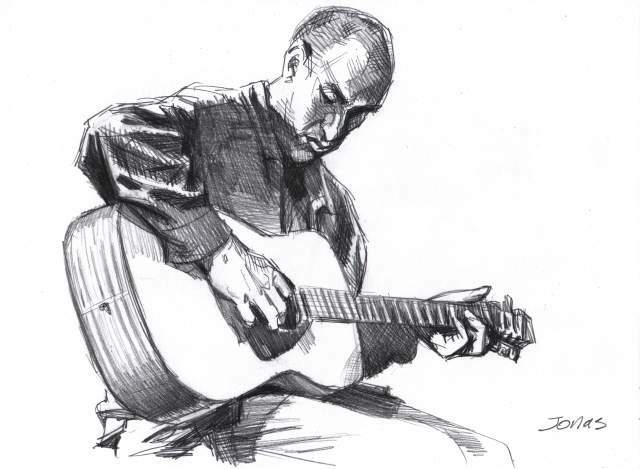 You are currently browsing the Artwork by D. B. Clemons blog archives for November, 2009.